Saturday, January 19, Act 10: The blocking of motorways weakens, occupations of roundabouts are increasingly cleared away by force (unless negotiated with local authorities), the marches in different cities appear more ordered, confined by marshals, Macron’s promises and his “great national debate” seem to sway some, there is talk of “yellow vest” candidates for the upcoming european parliamentary elections, “leaders” endeavour to stand out, the neo-fascists (“official” and “unofficial”) continue to circulate around the movements, the arrested and the wounded multiply, divisions and retreats announce themselves, the week following, an anti-yellow vest demonstration in Paris. Saturday, January 26, Act 11 … the weekly protests continue. And if the insurrection is to continue, it must fracture, divide and separate, create new autonomies both in the fissures of society and the Movement. Are the yellow vests Deleuzian? 2- The Yellow Vest war machine, or the immanent forms of life, the power of minority becoming when resistance, too often passive, patient or pathological, becomes insurrection, uprising, over-jection that breaks the subjection. In the article we are reading again, Deleuze refers to Primo Levi and the shame of being a man. Let’s start from this shame, the individualized face of (economic) horror erected into a system. The shame of having been forced to accept the compromise, to have agreed to survive (and simply survive – bare life) “in these conditions”. The shame of having to live in a filthy, ravaged, devastated, corrupt world, the filthy world of the flamboyant economy, the economy detached from everything, “without a ground”, and unrelated to any human dignity (despite the false promises of a “better life” – how many new lies?). To be compelled to compete; how we entered the orders; to escape pure misery. The shame of accepting, supporting, “representation” – representation treason – and the apparatchiks of the destructive economy, the DESTROYERS [CASSEURS] of life, the elected, mechanical followers fade away, in government by decree, in front of the voice of her/his master, in front of the accounting officers of the zombie technocracy. The DESTROYERS. They are from the High Castle. The shame of being forced to live this permanent horror, lie, corruption, extortion, fear threat, political gangsters, politocards [political game], and their banksters. And this petrol that burns Pakistani migrants in the middle of the Arabian desert. And this phone, smartphone sorry, which, suddenly, opens up my hand to reveal ragged children in the middle of the Congolese mud. And those clothes for sale that call up slum factory convicts from the misery of Bangladesh. And the shame and helpless rage that merge. Now, it is necessary that the Destroyers (those of the High Castle) be destroyed! This responsibility that the technocrats of government, the apparatchiks of the economy, do not even know. They, from the High Castle, they are without shame; this fills us with shame, for we obey cadavers, cynical fanatics; and the rage that causes flushes of hate. Ashamed of their absence of shame, of their horror, rage mounting to hatred. Legitimate defense of dignified life in the face of the exacerbated violence of the economic crisis. Rabies; and the hatred of these new Blood Lords of the High Castle of contempt. Finally a law against the Destroyers! Those of the High Castle. Let them all go to tropical (fiscal) paradises: profiteers of despotism, the little hands of authoritarianism. Shame that there are agents (accountants) who think only by abstractions (accountants): the measure of the grander of France in ruins that is determined in Berlin, the reactionary zealots of the “balanced budget”. Shame that there are such macrons; who are the shame of humanity – and we have been compromised by them – rage. Shame for not having been able to prevent this unhealthy corruption, fanatic economic fundamentalism, the exclusive service of the big shareholders – see the glowing eyes of the accounting agents. Ashamed to have survived so long without straightening up. Honor the Yellow Vests that wash us of this viscous shame. Ashamed of having made lousy compromises; to arrive, to arrive by the crushing (of the competitor) and by the DESTRUCTION. The only chance for women and men lies in revolutionary becoming, the becoming of redress (of insurrection) which alone can conjure away shame and RESPOND to the intolerable economic horror. Only the Yellow Vest, who answers, who shows who is responsible, accountable for the human. If a society is defined by its cleavages, its conflicts, its lines of flight, its minorities, then the of Yellow Vests movement is far more responsible than those who falsely claim the usurped title of “responsible”: responsible politician, economic manager, technocrat, the macron horror. And the most beautiful encounters are at the furthest point of the paralysed world (Brezhnevian) of the monstrous economy. Beyond all counting and calculation. When one’s shame must be overcome; to not perish suffocated; so as not to burst, dried up in a profitable mortuary. When rage and hatred demand the passage to action; not only the emotional release, but the recovery of oneself by oneself in and with the what is common. And, above all, if the most beautiful chants are chants of despair, then we must not be afraid to cry out this desperation, despair, to convert hatred into action. At the furthest remove from of quietist optimism, uneasy pessimism (dis-quiet, always in motion) is what turns blocked power into the strength of disaster. Destroy the destroyers (form above). To “disaster” the disaster. Negative dialectic of negative politics, the only democratic politics. To feel the burden of oppression, shame, rage, hate, which evaporates. Finally, to feel, to escape from the cellular cocoon, cottony and isolating cocooning. And its just unfolded wings cause the storm, pull us into the storm of life found anew. It takes a storm blast, even a tornado, to thaw the Brezhnevian world of the economy of macrons. The High Castle evaporates in the breath. The masters of the High Castle faint. And life dominated, incarcerated, flourishes again; even for a rare moment. Driven by the power of refusal that, without end, reconstitutes itself. And constitutes a fragile and beautiful form of life, the Yellow Vests form of life, meeting on a roundabout, and more, to rise up in a becoming dignity. Now the destruction of Europe. And what if the task of Europe was to empty out, to render barren? To create a depressive or austere emptiness, to constitute an area of low social, salaried and psychological pressure, to attract capitalist winds and financial typhoons. The grandiose goal of making Europe a vast Romania, or a small China. To force payment in cash, depressions, divorces, suicides, cultural or civilizational annihilation, to make those pay “who do not have the sense of the effort” (or of Petainist sacrifice), to make them pay, to pay for the leveling out necessary for the free race for wealth, speculative investments, stock market games, concentrated shareholding. Destroy all worthy lives so that all become competing speculators. To oblige everyone into the life of speculator – who is an accountant of what is calculable with uncertainty. First, the dread: the most brutal management, whose allegorical figure is a [Guillaume] Pepy, from the caste of murderous State nobles, assassins corrupted by their mission of annihilation; to open up the belly of houses, to open up to capital, to offer profitable servants, disposable operators, movable temps, to generate the Uber-man. Then resignation to servitude; or maybe prison; at best on the street. Wage deflation, competitive disinflation, to restrict domestic demand (systematically impoverish) to export better; the German model as a mirage, neither liberal nor neoliberal, a mercantilist of wage oppression. To Make all worthy life impossible for the classes of executants; to transform these classes into new miserable classes (to restore the taste for effort and the sense of work – the macron sarkozy petainist of the value of work). The famous operators, the executants to execute. And the contempt of class. The morgue of the new nobility, the macrons at the service of the “idea of universal capitalism”, the one before the war of 14, the capitalism of the captains of industry or the wolves of finance. To strike, to hit; to hit, to strike. With the greatest violence and the highest indifference. To take on board the gigantic British success: only one City, and HSBC, and an archipelago of ruined cities; a new oligarchy in Bentley SUVs and the new wretched, incarcerated in the Wal-Mart system, subprimes for the Uber-men. Rather the uprising than alcoholism. Rather voluntary solidarity action than the bitterness of the disputes over the inheritance of the aunt. Mismanaged communities, irresponsible elected officials – until the highest peaks of the contemptuous indifference of the fanatics of High Castle. Dissolution of the Welfare State presented as social progress. The great European nightmare, that of vertiginous inequalities, without any more stabilisation, without any transfer of corrections (Germany obliges). Permanent Lies (of the “governe-ment” [lying government]). Radicalised poverty and sought as a political objective (of work recovery). Hardening and violence of labor relations and all human relations: effect of German Europe or of European conservatism driven by Germany. Racialised poverty, opening to the happiness of fracturing divisions (the question of identity). All the fruits of (a so weak) growth are snapped up by the highest wages and by those who are rich enough to build large financial portfolios. Most of the overall growth is captured by the wealthiest who see their incomes grow more than 10 times faster than the overall growth rate; constantly accentuating inequality. Conversely, increases in the incomes of the least wealthy households (wages, pensions and Yellow Vests) are blocked at the level of the growth rate (less than 2% per annum); which results in a permanent decrease of the ability of these poorest categories to capture what is produced. All economic policy is subordinated to the needs of an oligarchy with unlimited greed. The economy is no longer a common project (assuming that it was once), it is no longer this project of common enrichment, so celebrated during the thirty glorious glorious years of development [les trentes glorieuses – the years between 1945-1975, in France, of consistent economic growth], but once again becomes the old exercise of collective theft, from robber barons to high-flying banks, the oldest system of extortion, of exploitation (now digitized). Destruction of the educational system: hatred of thought, contempt of the Enlightenment project. Precocious and confined professional training; return to the 19th century (finally!). The consequent impossibility of the famous social mobility: a return to the trades guilds! Destruction of the health care system; abandonment of old people to public or family charity (the melodious babel of a Raffarin). The grande return of the visiting bourgeoisie! Style, now, Resto du Cœur (as hospital was once an asylum for indigents). The fallback on family mutual assistance; with their stainless conflicts. The explosive cocktail (a macron cocktail with Troika petrol) of a ravaging economy; this is the great violence, the greatest violence. To which it is only possible to answer by such a weak, local, partial violence, before the globalisation of the damages, before the universalisation of the great economic delinquency (that of the macrons of all the countries). Economic delinquency of politically irresponsible: the accountant macrons. All life is now threatened by the economy; by managerial aggression, by authoritarian action (by orders) of the government of the macrons, by the calculating inhumanity of fanatical accounting agents. The dead of economic despair are found not only in Greece. We are all fleeced Greeks; by the Troikas of the macrons or of the angelic messengers of the salvationist debt. LONG LIVE THE YELLOW VESTS. The great turmoil of extortion: the increasingly unequal sharing of the product and the capture of its expansion by a clique (the famous 1%) of businessmen or senior officials converted to breaking employees (still Pépy and his brothers). The shameless indecency of thieves. How to reverse the balance of power and not be content with charity, whether it be Machiavellian (Macron) or syrupy philanthropic goodness, the goodness of humanistic billionaires, Soros, Gates, etc.? And as the “Protestants” (not Rocard!) shattered the cynical and laughing saints that adorned the reliefs of the prison buildings of the churches of surveillance, the “rebels” of the economic lie (3) are going to smash the centres of economic circulation. To paralyze the banks by multiplying withdrawals, to overthrow the despotic power of the company by all the forms of repeating strikes, by sabotage. The economy and its political system, the oligarchy of accountants, are conceived, with science, to harm as much as possible: to infantilise, to submit, to humiliate, to reduce (to a line of an account), to oppress, to compress (the costs); the economy is a colonial system and the lower or middle classes make up the hard belly of this category of natives of the economy. REVOLT OF THE INDIGENOUS ECONOMY. Inequality is systemic, constitutive, and the whole economic system is based on this propulsive inequality – not on an imaginary tendency towards equality. And in a constitutively inegalitarian economic system, and thus politically locked, blocked, frozen, congealed, democracy can make no sense (except as a disconcerting new lie). It is impossible to trust the institutions that defend this inequality (the High Castle and its miserable cottages). Elections are a trap (well known and well analyzed). The controlled debates are a simple governmental game, to take again the hand in a liars poker. “The representatives” only represent themselves, the caste and the clans of businessmen. These “novice” representatives form, at best, a clique of excited (villainous) believing (secondary) fanatics in the economy; they are the caste’s devotees sent to the front line! Return of monopoly capitalism and feudal bosses. Concentrations, rising profits and colossal dividend payouts, mega-salaries to incompetent and corrupt leaders (our national Carlos). All this on an immense foundation of new wretched: poor, precarious, adjusted, fluidified, temporary volatile and then liquefied (liquidated), uberized workers – all Uber-men. Exacerbated competition generates legions of losers and degraded regions. A polarized, biased, rigged system: where can democracy be hidden? Only a show of force and of legitimate self-defense, or counter-violence, can challenge ever more authoritarian power. And then, what will be the unmistakable sign of the coming revolution? That advertising trash, oddly named “women’s magazines”, like ELLE, have disappeared from the surface of the oecumene. And perhaps they will be preserved as spoiled (“cultural”) food for the surviving bankers. To remedy a whole rigged system, it requires a mobilization of magnitude is required. But this mass mobilization can come as surely and first of all from the extreme right: an American phenomenon à la Trump: the obscure event that deceives! Descent to hell like with the Greeks, oligarchic parade (this time in the rubbish of Paris Match, the dogs of the president), austerity disaster to pay for the criminals in place with villainous banks, corruption generated by inequality and impunity, the impunity of politically propagated inequality. All of this can only be fought by an uprising. But an uprising that the extreme right or ultra-right can mobilize (nothing new). European austeritarian automatisms presented as a response to inequality! To pretend to improve institutions by making them ever less democratic and more technocratic (the Monti attempt) – ever more German-style automatisms and independent technocratic agencies. And, correlatively, always more suppression of social services, or health, or school. The most minimal of universal incomes possible (or free grasshopper soups), which would replace any other allocation; almost eliminating the taxes of “liberal professionals”, doctors or lawyers – remains the voluntary contribution for the wealth police. Here is the Trump-style recovery – the Wauquiez-style, the ever so little democratic, terrible republican. To get rid of a single burden, the burden of the public debt, and everything will be illuminated! The conservative Taliban, German, European, the macrons of repression, have kept all of their energy and increased their aggressiveness tenfold; the troubles of the Macron clique can only excite them; by pushing the government more and more towards more right-wing austerity right. Inequalities, unfair taxes, poverty wages, etc.? One solution: the budget cut! The beginnings of total paralysis: the imported Tea Party programme. This is the destitution, seen from the right. The fundamental mission of Europe, the Euro Zone, Germany, is not to serve and protect its citizens, but to provide globalised capital, American or Chinese essentially, not even European, a regulated sports ground (the only rule for forsaken competition) and deregulated (trusting self-regulation and competition), where attractive resources can be extracted: exploit, divert, collect, etc. Europe sells its depressed space, its controlled “workers”, the assumed social dumping. The basic mission of Europe is to ensure a stable framework (ordo-economic) to “allow” effectively for Chinese-like exploitation. The competition of systems and norms, suicidally defended by the ideological and fanatical Europe (of neoliberalism), inexorably leads to a dual system, again, to a Chinese type system or leads us to the underdevelopment of the United States. The future of Europe is that of oligarchic stratification: the heights of a financial complex of very large companies associated with banks or insurance companies, all protected by a police state, these heights crushing second-class/zone citizens, more and more exploited or liquefied. The economic equilibrium is realized by a depressive (or recessive) spiral towards maximum inequality and the polarization of classes. Europe’s fundamental mission is not to serve and protect its citizens, but to serve and protect the oligarchic complex of the financial capitalism of the heights. The fundamental mission of Europe is to remove the old European political order (that resulting from the cold war) to generate a transparent Europe, “illocalised”, no more even a place, at best a node of circulation in the global order capitalism of global multinationals. Maybe even Europe is already out of the game, thrown off of the sports field which it had conceived as its most grandiose achievement (the big open market)? Can Wall Street and Shanghai (and Hong Kong or Singapore) bypass the European knot? There is no choice but to dismantle the hectic and deadly machine of the economy, as well as its financial booster. To dismantle the financial machine: to storm the banks, to tar the senior leaders of this high-ranking public service. To immobilize the economic machine and its infernal circulation. The technocratic, liberal, neoliberal, neoclassical, ordoliberal economy, with its constitutional rules, revolving around guarantees for unbridled competition, this economy of misfortune hits out violently at the moral economy of life, with its rules of mutual aid, of protection given to the weakest, of solidarity and, finally, of equality. The welfare state had tried to maintain a certain (already biased) balance between inequality, at the foundation of economic power – the neo-feudal aspect of things that claim to be modern – and the equality necessary for the moral stability of “the social republic”. But this balance is now totally broken. And this rupture, in the form of an undeclared war, has struck and domesticated all those who still consider the moral economy of mutual aid, protection and solidarity (“the family economy”) to be a vital necessity; all those who try to maintain or save this moral economy, even within the narrow confines of the family, have revolted against the cynicism and corruption of the technocratic economy, with its proud macrons. But the neoliberal economic disaster has so devastated all non-economic forms of life that the family now seems to be the last refuge, but a very reactionary refuge. For this refuge has long been colonised by religion: the moral revolt against the disastrous economy could become a movement of the reactionary right; as exemplified by the American trajectory of Sarah Palin to her Trump emulator. There has always been a right-wing anti-capitalism, often romantic and reactionary (morally and socially). The Yellow Vests war machine must fight on two fronts: destitute the economy, reconstitute the commune, but also prevent that the destitution of the economy does not lead to a new form of “home economics”, managed by religious sects, specialists of privatized charity. The interview that we call upon was republished, in the same year 1990, in a collection of texts organised by Gilles Deleuze, entitled Pourparleurs. This collection contains another very important article, revolving around the same theme of rebellion in a despotic regime: Post-scriptum on control societies. Let us note immediately, for the services or organs, that a “machine of war” is a philosophical concept invented by Deleuze, in a Thousand Plateaus, a concept which designates a certain way of inhabiting space-time, a concept which we make by “fighting in common”. In a vocabulary closer to Agamben, it would be necessary to speak of “form of life”: the form of life of the Yellow Vests, meeting on a roundabout, and more, to have emerge a becoming dignified or human (beyond any economy ). The debate on the question of forms of life, the lives not separated from their fashions or their forms, the unalienated lives one would have said at the time, this debate has been the subject of an intense literature. Let us quote, somewhat randomly from a library shelf: Agamben and radical politics, ed. by Daniel McLoughlin, 2016, a book that revolves around this notion of life form, affirmative biopolitics, poor practice, inoperativity or idleness, surpassing incorporation, the machine of war, etc. Look, among others, at chapter 10 of the book: What is a form of life? Giorgio Agamben and the practice of Poverty, Steven DeCaroli. We have been using the concept of “macron”, a common name, for many years now. A macron is a MIB, man in blue, black dark blue suit, blue europe tie, with a rosette of the legion of horrors. The MIB macrons are armed (accounting) agents of the Troikas. Fundamentalists of the blazing economy, agents of financial capitalism or managers of (shareholder) rent.But they are above all (dangerous) fanatics of neoliberalism, destructive terrorists.Fundamentalists of structural adjustment or “modernization”.Destroyers who think they are invested with a sacred mission: hence their common aspect of evangelical preachers or witnesses of capital. And Macron, in flesh and bone, is only an indifferent element of the Macron class (here, in this case, Macron is the child of the difficult delivery of Attali, fertilized by Sarkozy, or conversely, a macron is hermaphrodite, “transgender”). What characterizes this class of macrons, or agents (accountants) of destructive structural adjustment, in the Greek manner, is her/his ideological or religious dogmatism; the class of MIB is the class of fundamentalist fanatics of austerity salvation (neo-petainist), the class of missionary soldiers of the salvation of the nation (the salvation army). Even the great messenger Angela, of Greek tomatoes and the Angel of German capital, can not hide her very Lutheran (or very Swedish) austerityAngela is certainly Lutheran, but certainly not Protestant! Because she inherits from the consolidated Luther, the one who condemns the revolt of Thomas Müntzer, the war of the peasants at the origin of a (true) Protestant protest. And these protesting Protestant peasants are ancestors of Yellow Vests, the Yellow Vests of Saxony Thuringia (and in the 16th century). On the contrary, Angela, the macron chief of Germany, reveres the Luther of princes and authorities, rules, ordinances, Luther the political calculator and founder of a new church of incarceration. The economic lie is a classic theme of the critical literature of economics. Let us mention only a recent and remarkable work, Nicolas Bouleau, Le mensonge de la Finance, with a preface by Gaël Giraud, Les Éditions de l’Atelier, 2018. Let us refer to “liberal” economists, in the American sense (Keynesians of the generalized economy and anti-neoliberal). Paul Krugman, economic columnist for the New York Times, Nobel Prize in Economics 2008:”What is the common point of consensus before the crisis (of 2008) and that after the crisis (say in 2015)?These two consensuses (first of Washington, then of Berlin) have both contributed to the destruction of the social system: deregulation has paved the way for the crisis, and we add, after the crisis, the premature recourse to austerity. The budget has contributed more than anything else to impede recovery and increase inequality, and we add one layer. But one and the other consensus, first from Washington, then from Berlin, corresponded to the interests and prejudices of an economic caste whose political influence has increased more than proportionally to its scandalous increase in wealth. Some experts may prefer to depoliticize the economic debate, to make it technocratic and supposedly non-partisan. These experts cradle interested illusions and systematically lie to us. Even on issues that may seem profoundly technical and purely technocratic (such as financial regulation or the creation of artificial neo-markets), it is always issues of class and inequality that end up distorting the debate.” Robert Reich, former Secretary of Labor Bill Clinton:”For twenty-five years, I have explained at length, in books and conferences, why the working middle classes of the developed countries like the United States have not gained ground and are subjected to more and more austere pressures. But my reasoning missed out on a phenomenon of paramount importance: the growing concentration of political power in the hands of a financial and commercial elite that has managed to transform the political rules and those that govern the economy. The problem lies in the question of who is driving the governmentr. Who can still claim not to know who is driving the government? At the senior official level, revolving doors operate at full capacity; senior officials are panting with impunity in the upper echelons of finance; then they come back to the government to impose the agenda of financiers and very senior executives of global companies.” Bernanke and Geithner in the United States, Jean-Claude Trichet and Macron in France, etc. This entry was posted in Commentary, News blog and tagged france, gilets jaunes, Gilles Deleuze, insurrection. Bookmark the permalink. 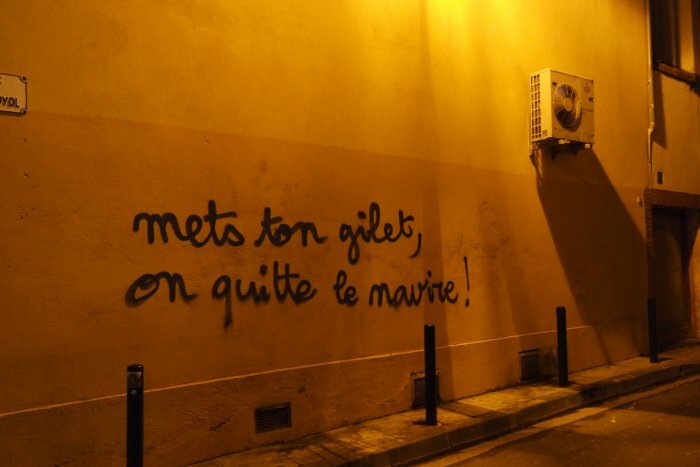 Pingback: #GiletsJaunes: Fractures and lines of escape – Enough is Enough!